Join Us on an Artful Journey into the World of Visual Arts! Students were challenged to design and create a tripod vessel inspired by stylized or abstracted imagery of the human figure, an animal, or codex as depicted in Pre-Columbian cultures. Students considered and compared Pre-Columbian formal and functional vessel usage. They also considered modern day form and function of the vessels that they created. 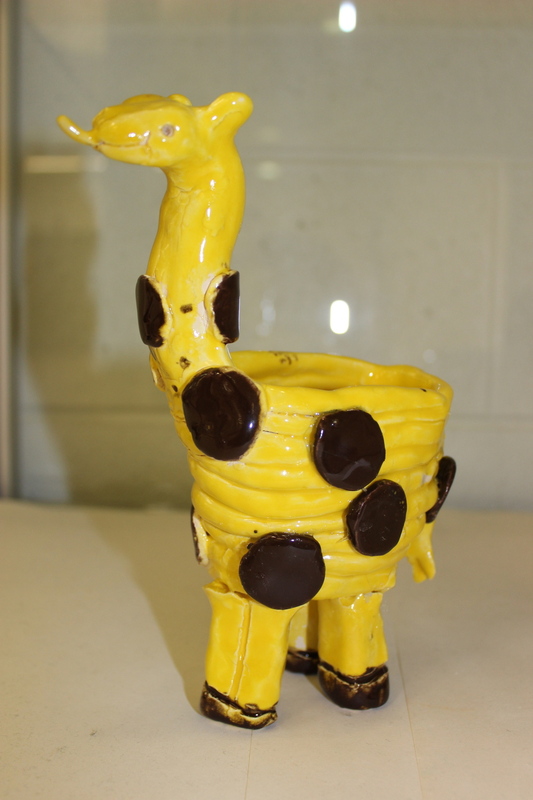 Look at how this student used problem-solving skills to turn a four legged animal into a tripod vessel. In this lesson students broke up into groups of 5-8 to create lists of masks. They considered masks that they know of, have seen, and have worn. Next the whole class joined together to create categories of masks and determined what category their masks would be placed in. Lastly, they decided that some categories could belong within others. For example the Halloween category was placed into the Celebrations category. Some of the final categories included Protection, Ceremony, Health, and Sports. Together we took a visual journey of masks in time and place. While students viewed mask imagery they considered the idea of “making” one’s identity as they were introduced to Theatrical, Ceremonial, and Festival masks. Students brainstormed and drew out at least four different mask ideas before they decided upon a final design. The final design was edited and made actual size and then taped onto colored metal tooling. The lines of the design were traced and then the paper was removed so that the foil could be pushed in or out on either side in order to create the interest of texture. Next students chose areas of the mask to highlight with color using permanent markers. Finally students decided on what embellishments they wanted to add to complete their mask. After the masks were completed, students created wall tags for their mask, which included the category of the mask, and it’s use. Students were introduced to M.C. Escher and his work with tessellations. As they observed and analyzed these images they recognized how they could be used to create pattern. Students worked to created their own template to trace while interlocking the traced template with repetition they came up with at tessellation design to embellish. This lesson began by looking at images from the Art in Island 3D Art Museum in the Philippines (near Manila-The Selfie Capital of the World”), where the museumgoer is encouraged to interact with the art. We also looked at chalk drawings by Edgar Müller, 3D street artist known as the “master of three-dimensional illusion street art”. From here students worked to create their own interactive imagery. Students decided on a situation to render that they would be able to interact with. Interactions could be with their hands, feet, face, upper body, or whole body. Photos were taken of student interactions and displayed alongside the original work. The display allowed for others to take part in the interactive art and also offered photo opportunities. During art making we also looked at videos displaying time laps realism drawings in order to consider how we could push ourselves to create a more believable setting. Students were introduced to the concept of contour line drawing. They saw example videos of blind contour line drawing and then tried it out by drawing their hand and then their shoe without looking at their paper. The primary goal was to capture the outlines and the details within the lines. This exercise is essential in strengthening hand and eye coordination. Creating bind contour line drawings also helps to sharpen observational skills, which is necessary in accurately rendering realistic images. Gesture drawing was also introduced. The focus was on portraying action and movement. These drawings were quick renderings depicting the whole of the figure as opposed to the outline of an object. Drawings were done in watercolor marker so that a wet brush could be applied afterwards to imply movement or action of the figure. Figure drawing was introduced at the end. Here the goal was to bring together the technique of contour line drawing of objects along with simple gestural drawing of a figure. Students will use light gesture drawing to begin their sketch and then create the details of the outer costume and gear by using the contour line method. Proportion will be accomplished by breaking up the body into chunks of shapes. Relationships to size will be taken into account. Fourth graders worked collaboratively to create this butterfly mosaic for Children's Hospital of Troy. The image was chosen because of its symbolism for healing and transformation and its representation of joy and happiness. In support of the Healing Arts Program acknowledging art as being an important part of delivering care, not just decoration we are thrilled to present this work and be a part of the program's belief that "It takes a Village to Heal a Child". Fourth grade, Miss Caruso, and Mr. Beattie proudly displaying the Butterfly mosaic. Fourth graders participated in the My Green School Art Contest. We looked at some inspiring youth from around the globe to see what they are doing to help their school and the planet! Boyan Slat, a Dutch inventor from the Netherlands began his crusade and founded the organization The Ocean Clean Up when he was just 16 years old! Can a bunch of Australian school kids really change the world in five minutes a day? This class of primary students demonstrate over the course of a week that it only takes five minutes a day to make a positive impact—from recycling to planting fruit and veggies and telling jokes. Green School, Bali, Indonesia. A community of learners making our world sustainable. Congratulations to Fourth grade artist Olivia who won first place in the state level of the 2016 My Green School Art Contest sponsored by the U.S. Green Building Council, Detroit Regional Chapter. Olivia's work is on the way to Lancing to be displayed at the Great Lakes Renewable Energy Fair in June. Well done Olivia! Mixed up Puzzle Squares. Students designed a four-piece continuous composition with a focused theme of a specific subject matter that was repeated. During our brainstorming students came up with such examples as sports, animals, nature, technology, hobbies, and activities. Separate objects were drawn onto the four inner overlapping sides and then the puzzle squares were rotated in order to repeat imagery on all sides. By doing so these added images offered individual but not overall solutions to the puzzle, as there was only one way to complete it correctly. Students had the opportunity to solve each others puzzles during planning and after production. This served as both a formative and summative assessment. Students learned how to make monoprints by using tempera paint and miscellaneous tools for mark making on the table as a printing plate. Monoprinting is a process whereby only one print is pulled from the printing plate. This can be modified for any grade level or ability. Students chose from a variety of animal prints to create this observational drawing. This lesson introduced the use of a grid to get correct placement and proportion while enlarging the image. Students layered and blended a variety of colors to get specific colors. Students learned about line and how it is a basic element of art. The focus was on both line variation and line quality. Color relationship was considered through the understanding of color scheme. This lesson exposes students to the design principles of rhythm and space through repletion and overlapping. Other art elements and design principles occurring in this lesson such as shape, texture, pattern, variety, unity, balance, emphasis provide further opportunities for understanding and explorations. Students used collage and oil crayon to create these whimsical pumpkins in the moonlight. We began by viewing photographic imagery of real pumpkins. We observed the various shapes, colors and lines within each pumpkin. Students began by first drawing then coloring their pumpkins on colored construction paper. Once fished the pumpkins were carefully cut placed upside-down onto a finished background. They were then traced in order to create a shadow. The shadows were then colored in and the pumpkins were flipped back up glued down above the shadow. The students determined where their moon would be placed in order to have a light source for their pumpkin shadows. Students worked with horizon line, background, middle ground and foreground to lay out their composition. We discussed how things look smaller the further away they are and bigger the closer they are. Students then used hot/cold color schemes to color their pictures with chalk pastel. I began by reading the book “Lost in the Woods” by Carl R. Sams and Jean Stoick. While referencing photographic imagery of woodland animals students began by drawing a woodland animal or creature in pencil onto a 6” x 6” piece of paper. They placed the animal in a simple setting. They colored their image with colored pencil. The students replicated their drawing onto a piece of burlap with chalk. Students learned the basics of stitching. They practiced threading their own needle and they learned a simple running stitch. The running stitch of was used to follow the drawing on the burlap with colorful yarn. Students created beautifully realistic fall trees with mixed media on paper. We began by viewing photographic imagery of real trees. We then stood up like real trees to demonstrate the how they are strongly rooted and to experience the different directions that the branches go. Students began their work by drawing a tree with oil crayons. Later, they added fall leaves to the tree branches and also falling to the ground with tempera paint. When the leaves dried they went back on top of them with oil crayons to duplicate the changing colors of fall leaves. Students mounted and signed their own work. First grade went on a virtual tour of the Lascaux Caves in France. We considered the stories within the paintings. We talked about how they were created and considered the medium used and the color palette. Using this knowledge and simple animal imagery students created their own cave paintings. The students worked under the tables in the dark to lit by campfire on the SMART Board to the sound of crackling fire and crickets in the background. First graders created a Batik name design. Batik is both an art and a craft, which is becoming more popular and well known in the West as a wonderfully creative medium. The art of decorating cloth in this way, using wax and dye, has been practiced for centuries. In Java, Indonesia, batik is part of an ancient tradition, and some of the finest batik cloth in the world is still made there. The word batik originates from the Javanese tik and means to dot. First graders drew their name in bubble print and blocked out sections in the background. They colored completely with crayon and then outlined with a black oil crayon. The last step was to crumble the paper in order to create cracking in the crayon and then cover with black paint. Together we viewed a beautiful video (with music) of Koi fish swimming in a large outdoor pond. Inspired by what they observed in the video students recreated the movement, shapes, and colors of the Koi fish. This process began by drawing Koi fish in water with watercolor crayons. Next, we used a paintbrush with a small amount of water to activate the crayon and paint the piece. Observational skills through observing the movement, shape and color of Koi fish. Students combined basic shapes and lines to draw their castles. They learned about warm and cool colors and determined what color set their sky or castles would be. The students used water-soluble marker to apply color and then painted over the marker with water. We began by reading the book Mix it Up! By Henre’ Tullet. Students had the opportunity to “mix it up” with tempera paint. Joyful comments were shared of their discoveries as they experienced blending colors. For the second part of the lesson (day two) we looked at images of snails and beetles. We welcome in spring by using oil pastel crayons to turn the color mixes into beautiful creatures in the spirit of spring exploration!